Naming your chickens is a very important step in your role as one who chickens. Or at least I think so. There are plenty of people out there who are fine with chicken anonymity. It probably makes it easier if you’re the type who lops their heads off and then gets on with your life, but that’s not my style. I’m not a head lopper, or a neck twister, or whatever other ways there are of dispatching a chicken. To me, they’re pets who happen to also produce food, which puts them slightly above our cats. I’m not about to eat what those ding-dongs produce the most of. But pets need names, and I am not one who enters into giving out names lightly. But if I do give a name, I don’t always stick to it. My attitude is that you don’t always know what to call someone until you really get to know them. Because of this, I find myself in situations like where my cat Hamish is known as “The Bone,” thanks to the convoluted logic of my mind. If you know him, it makes sense. My wife often has to tell my son, “you know how daddy always calls things by different names.” I need to experience your essence before I can figure out your true name, man. 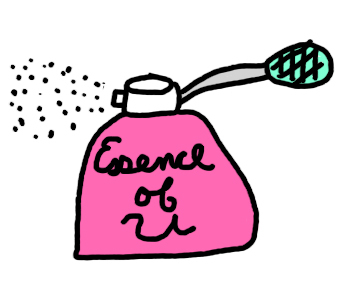 Your Essence, available wherever horrible smells are sold. With our chickens, I had tried to not give them names the first time around. Since I didn’t know what I was doing, I really thought I was going to mess it up and kill them somehow, and I figured no names would give me some sort of emotional distance. But because it turns out chickens had more personality than I was expecting, I found myself referring to them by names in my head, and those names stuck. 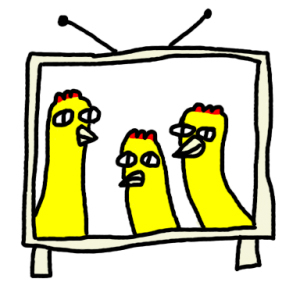 Boss Chicken got her name because from day one she was all up in everyone else’s business, pushing them around. Henny Penny, as cliché a name as that is for a chicken, got her name because she was afraid of everything. Suzy Creamcheese . . . well I suppose she just seemed like a Suzy Creamcheese. And then there’s The Mandrell Sisters. They got their name because there were three of them, like the actual Mandrell sisters, and I couldn’t tell them apart, so a group name was the only way to go. I couldn’t just not give them a name after I had named the others, now could I? That’s just rude. 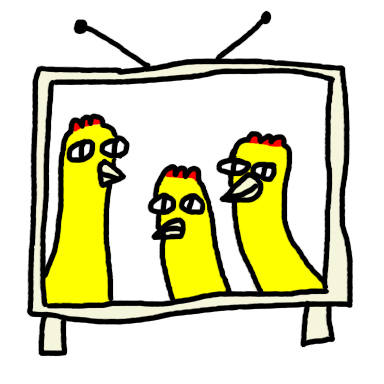 They even had their own TV show at one time. Now that we’ve got three new ones, I knew the naming issue would come up again. My parents, who I split the chick order with, first considered doing a Mandrell Sisters type group name for their chickens, and then settled on Gladys Knight and the Pips. It works out well, since Gladys is a different breed of chicken than the Pips, and she’s also the Boss Chicken of that bunch. We didn’t have any strong personalities here with our new ones, so that made it harder to come up with anything. I wasn’t too worried about it, though. 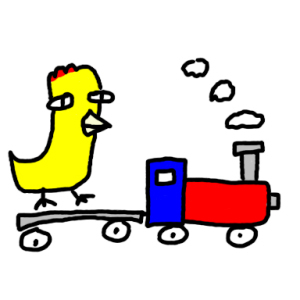 I knew with time I’d figure something out, and I was so focused on getting the new chickens integrated with the old ones, that I barely had time to think about names anyway. Leaving on the midnight train to Georgia, by way of Tidmouth Sheds. Then my son began to ask what I was going to name them. I told him I hadn’t thought of any names, and suggested that he could name them if he wanted to. I knew the risks involved here. When my wife was his age, she named her dog “Oscar the Baseball Player.” To be honest, that’s not too far off from some of the names I come up with anyway. The new chickens are two of one breed, and one of another. My son said he wanted to name the lone one Suzy Creamcheese, since the original Suzy Creamcheese died back in spring, and he had been fond of her. I said we couldn’t name her Suzy Creamcheese, because there had already been one, but we could name her Suzy Creamcheese Junior. He was o.k. with that. That left the two of the same breed. He thought about it for a few minutes, and then decided he wanted to name them Steve and John. My wife pointed out that the chickens were girls, but he didn’t care. Seeing as how I once had a girl cat named Phil, I was in no position to complain. And frankly, I don’t think I really have anything to complain about. 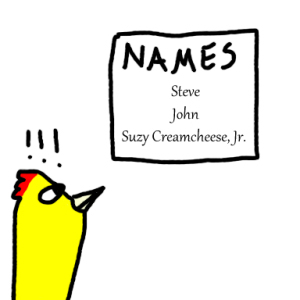 Steve, John, and Suzy Creamcheese Junior are names that any chicken would be happy to have. Chickens are so excited the day the new names come out. This entry was posted on Friday, October 17th, 2014 at 3:00 pm	and is filed under Backyard chickens, Chickens, podcast. You can follow any responses to this entry through the RSS 2.0 feed. You can leave a response, or trackback from your own site.